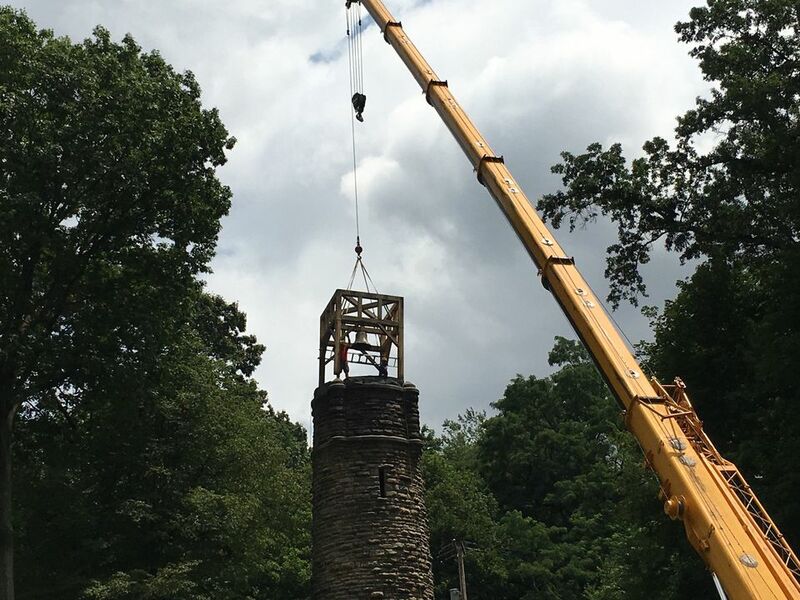 AKRON, Ohio - The historic bell tower at Glendale Cemetery was rechristened on Tuesday and returned to its place atop the stone tower where it was installed 130 years ago. Local leaders, historic preservation specialists and the public came out to see the 700-pound bell and 8-foot framework replaced using a 100-foot crane. The bell tower was brought down in April for restoration in a delicate operation. The framework for the bell was rebuilt in June during a timber framing workshop led by master timber framer Rudy Christian. The white oak framework is authentic to the original structure, and will strengthen with age. The 14-foot pyramid-style roof, restored with a synthetic version of the original slate tiles, went on separately. The bell, created by Cincinnati-based Buckeye Bell Foundry in 1880, has been silent since vandals stole its clapper decades ago. Now, restored with an electronic striker, by Verdin Bells & Clocks, the bell will once again commemorate Akron's important occasions. Leading the restoration were ARRC, the for-profit historic restoration arm of Stan Hywet Hall & Gardens, which served as construction manager for the $300,000 project and Friends of Historic Glendale Cemetery. Local firm Braun & Steidl Architects developed the restoration plans for the the bell tower. "The convergence of these groups was a perfect fit," said Glendale Cemetery Trustee Rick Krochka, who also is past president of the board of Stan Hywet. "To have restoration specialists right down the street who know how to pull all these specialists together and make sure it gets pulled off right is a big deal." The restored bell tower stands on a small ivy-covered hillside, known long ago as Ordnance Hill. The hill has been cleared and landscaped with a pathway so the public can have a closer view of the tower. LED lighting is being added at the top of the tower, and floodlights will illuminate the stone structure from below. Founded in 1839 as Akron Rural Cemetery because of its location on the western edge of town, Glendale was a recreation area as well as a burial ground. In the early days, the cemetery caretaker pulled a rope in the bell tower at 6 p.m. to signal it was closing for the day. The bell also tolled during every funeral procession in the late 1800s. By the early 20th Century, funeral customs had changed, and the bell was silent except for special commemorations, such as the end of World War I. The bell tower is listed on the National Register of Historic Places -- along with the Memorial Chapel, Caretaker's Lodge and Cemetery Office. Glendale Cemetery is located at 150 Glendale Ave. near downtown Akron.